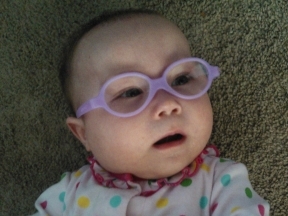 That is my daughter Julia with her first pair of miraflex glasses. She is farsighted. She is now onto her second pair that are rectangle and blue(like the blues in the movie frozen) I recommend miraflex to anyone with a small baby or toddler that needs glasses as they hold up very well, so well that we donated that pair of glasses in that picture to lions Lincoln club to help children who’s family’s can’t afford to buy them glasses.